Happens often enough where we can probably have a dedicated thread. Doesn’t California have some of the most restrictive gun laws in the nation? Wharf Rat wrote: Doesn’t California have some of the most restrictive gun laws in the nation? That's the ticket. Little kids are dead because there wasn't someone there to shoot the guy. How many times has that actually worked? Maybe take the word "mass" out of the title with that lead story. That's a Tuesday night in Chicago. uscbucsfan wrote: Maybe take the word "mass" out of the title with that lead story. You people are truly disturbed. Where did I say it was ok? well, this thread lasted as long as the random terrorism one before it became asinine. we still got it baby!!!! It was an honest question. The next question would be: if restrictive gun laws don’t stop these kind of attrocities, then what is the solution? Edit: keep in mind I have a 10 year old, and stories like this one scare the **** out of me. What are the gun laws like in Texas? I don’t know for sure, but I’d imagine they’re pretty light. Not sure how that answers my question though. Gun laws didn’t stop the attrocity that you mentioned, so what is the solution? Where do we go from here? Not sure how that answers my question though. 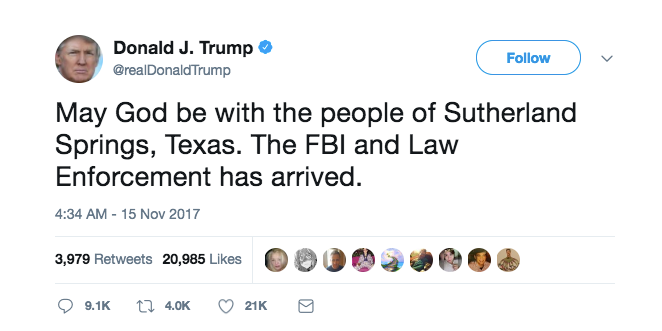 Gun laws didn’t stop the attrocity that you mentioned,so what is the solution? Where do we go from here? Let's maybe look to Australia if you want to only look at extremes. See that's why the other 3-4 threads are sufficient. It's the same talking points, same debate, same ignorance, and the same inability to hold discussions. (I'm not directing this at you). See terrorism thread, guns thread, random politics thread. Primarily, we have a culture problem. Secondarily, we've got a gun problem. You don't solve the secondary problem without first solving the primary problem. And you don't solve the primary problem by simply eliminating the secondary problem. Both are intertwined and neither will get solved if the primary problem isn't first addressed. beardmcdoug wrote: Primarily, we have a culture problem. Secondarily, we've got a gun problem. Spot on...at some point the killer says to himself/herself that the victim deserves to die. That decision isn't made because there are guns...there have always been guns, we haven't always murdered at the rate we do now. Yes, guns make it easier to carry out the decision and unfortunately to execute it with more precision, but in most cases, I'm guessing guns don't influence the decision itself that someone deserves to die. We have a society in which far too many people think the loss of life is justifiable. There are myriads of things that have led us to that point, some of which include: glorification of violence in pop culture, lack of personal responsibility, lack of respecting the dignity of human life, lack of fear of punishment, a society that thinks all problems should be immediately solvable without compromise, etc....I'm sure there are many many more. You might need a break from the internet. Maybe that tweet got saved as a draft and just sent out? Timing seems odd considering that happened 10 days ago. DreadNaught wrote: Better late than never? He had one back then, too. 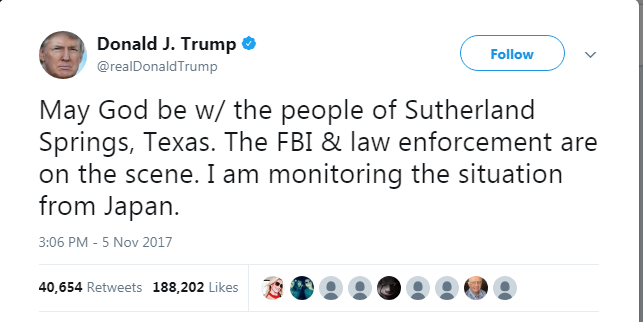 My guess is he forgot to change the city name for his mass shooting copy/paste tweet job. The one regulation that I think would be a common sense regulation when it comes to gun ownership is a national requirement to pass a gun safety and skills class to be eligible to purchase a firearm. Things like trigger discipline would have likely prevented this incident. If I mention that to many gun owners I know (I have a few friends in law enforcement) they wholeheartedly agree, but in the context of a politically charged conversation I've had a few others say that's just a slippery slope to taking guns away which is, in their view, what I really want. Most states require you to pass a proficiency test in order to carry. That being said, they are pretty much a joke -- at least in Texas. I think there were about 25 people in the class I went to years and years ago and all 25 passed and some people flat out sucked. They basically got "coached" during the exam until they were able to pass. as it pertains to this story...assuming TN is like most states and this guy had a right to carry, he most likely did pass a proficiency test at some point. he just did something really stupid. bucfanclw wrote: The one regulation that I think would be a common sense regulation when it comes to gun ownership is a national requirement to pass a gun safety and skills class to be eligible to purchase a firearm. Things like trigger discipline would have likely prevented this incident. If I mention that to many gun owners I know (I have a few friends in law enforcement) they wholeheartedly agree, but in the context of a politically charged conversation I've had a few others say that's just a slippery slope to taking guns away which is, in their view, what I really want. I think something like a tax break on annual refresher training for weapons proficiency could go a long way. Do you mean making it possible to deduct the cost of a class on your federal taxes? And that is my problem. Hell, I got better educated in gun safety as a boy scout before I could fire a .22 rifle than most people get before they purchase a Ruger Super Redhawk. But suggesting a national standard for required training and testing seems to really upset some people and I honestly don't know why. bucfanclw wrote: But suggesting a national standard for required training and testing seems to really upset some people and I honestly don't know why. While it doesn't upset me...I can see why people would be opposed to it. Can you give me another protected right under the constitution that someone needs training in order to exercise? Last edited by Zarniwoop on Fri Nov 17, 2017 11:03 am, edited 1 time in total. Which would save the average taxpayer what, $5-$10? People keep saying tax breaks like it's some sort of actual incentive for things but I don't see it. But that's an argument for a different thread. I agree...that was my point. A $20 tax break (classes are at least $100), wouldn't incentive a lazy gun owner to go to the gun range.